Another special collaboration with colorist Linh Phan of BESCENE where both artists could have fun and let their creativity run wild. 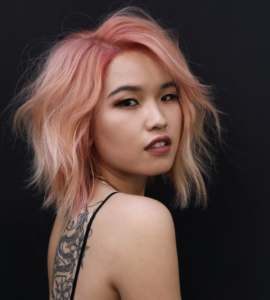 Phan’s coral-cotton candy hues are naturally placed to give depth around the roots and hairline, while lightening up throughout, which Anh emphasized through voluminous styling. He mixed up using the Nu Wave and Lived in Wave techniques, breaking them up by scrunching through some L’Oreal Professionnel Siren Waves for bounce and separation. The look was finished off by applying DePolish on the ends, twisting individual strands for a naturally textured look.